You will earn 15,199 Reward Points. Earn 1 reward point for every 1 dollar spent. 316 Series stainless steel jacket liner. Main and simmer steam supply valve. Mounted on stainless steel 2" diameter legs with adjustable flange feet. Spring assist hinged stainless steel cover with condensate ring and drop down lift handle. Steam pressure gauge and thermostatic steam trap all mounted and interconnected ready for final connection. Kettle interior bottom sloped to front for smooth product flow through a mounted, tapered, plug type food product draw-off valve of standard 2" diameter. Three inch compression tangent draw-off valve with perforated strainer. Security type fasteners with tack welds. Stainless steel step over draw-off valve with chain. P.R.V. – Pressure reducing valve. Perforated stainless steel triple basket assembly. Double pantry pot filler lead-free with vacuum breaker. (12") (18" double jointed) single pantry lead-free faucet. (12") (18" double jointed) double pantry lead-free faucet. Double pantry washdown hose lead-free with vacuum breaker. Double pantry washdown hose with 16" add-on lead-free faucet with vacuum breaker. Clean-up kit, includes draw-off brush, clean-up brush and paddle scrapper with 40" handle. 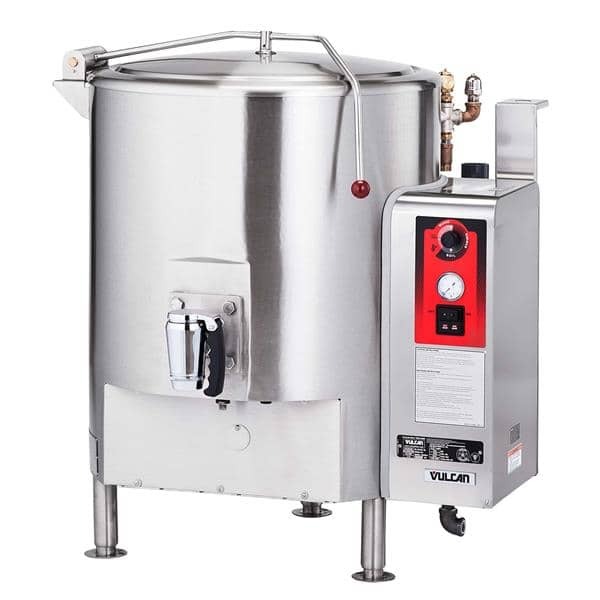 Direct steam fully jacketed stationary kettle. Kettle is mounted on 2" diameter legs with adjustable flanged feet. The kettle liner is constructed out of 316 Series stainless steel. Spring assist hinged stainless steel cover with condensate ring and drop down lift handle. The dish shaped interior bottom is sloped to the front for a smooth product flow through a mounted, tapered, 2" plug type food product draw-off valve. Draw-off includes opening strainer. Graduated measuring rod. 15 PSI relief valve, vacuum relief valve, main and simmer steam supply valves. Steam pressure gauge and thermostatic steam trap all mounted and interconnected ready for final connections. UL listed. Classified by UL to NSF Standard #4. Meets ASME code. The customer service I received throughout this whole order was outstanding. Very nice people, fast responses, and quick delivery. Thank you for everything.